Additionally, the new Mac Mini sports HDMI and an SD card. 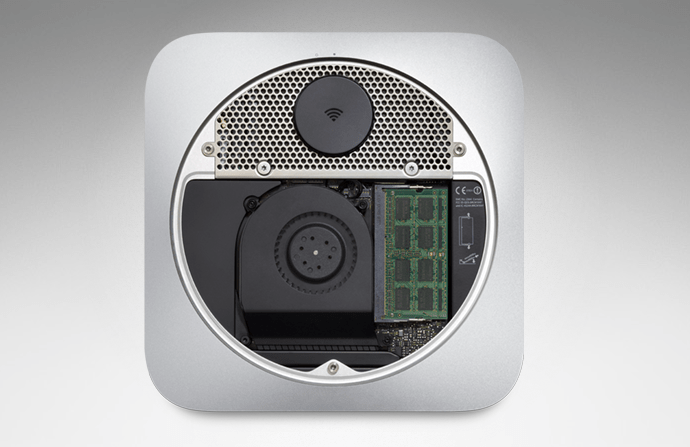 The new Mac Mini could fit comfortably instead of your current DVR. Could we expect HDMI to come in future updates? Also, unlike previous generations, the RAM is now more easily accessible. Twist the panel from the bottom of the Mac Mini and your good to go. Over the past week I have had the privilege of reviewing a variety of Powermat products. Ten years ago, only a few people could image paying $40 for an SD card or being able to wirelessly charge their device. Contrary to popular belief, the Powermat does not provide wireless charging when you are a given distance. Once, your device connects to the Powermat through a case or universal receiver, Powermat does all the hard work. What can you do with a Powermat? 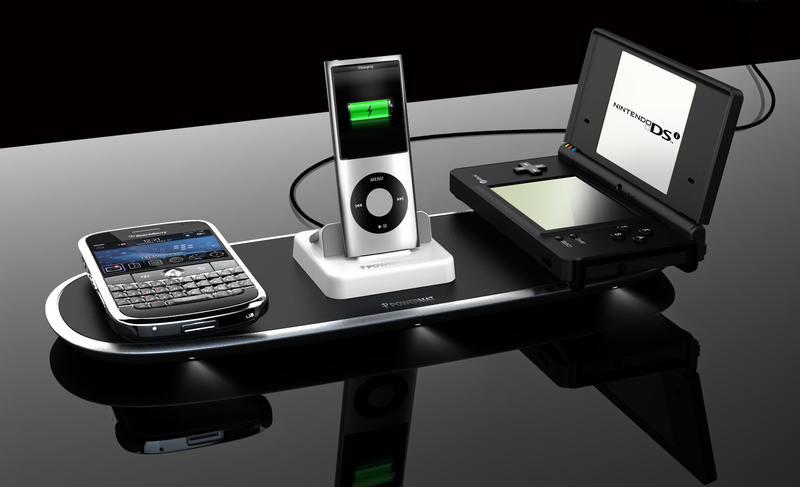 Well, the Powermat enables charging of your technology devices simple and easy. To charge your iPhone or device, set your device on the magnetic surface of the Powermat. The Powermat iPhone case is somewhat bulky, but provides protection for your phone. If you prefer not to use a specific case, use the universal receiver, which has a myriad of interfaces from LG to micro usb. Additionally, if you own more than one iPod or someone decided they needed to use your charger, the Powermat proves to be a helping hand. In a few flavors of the Powermat, it permits up to 4 devices to be charged simultaneously. 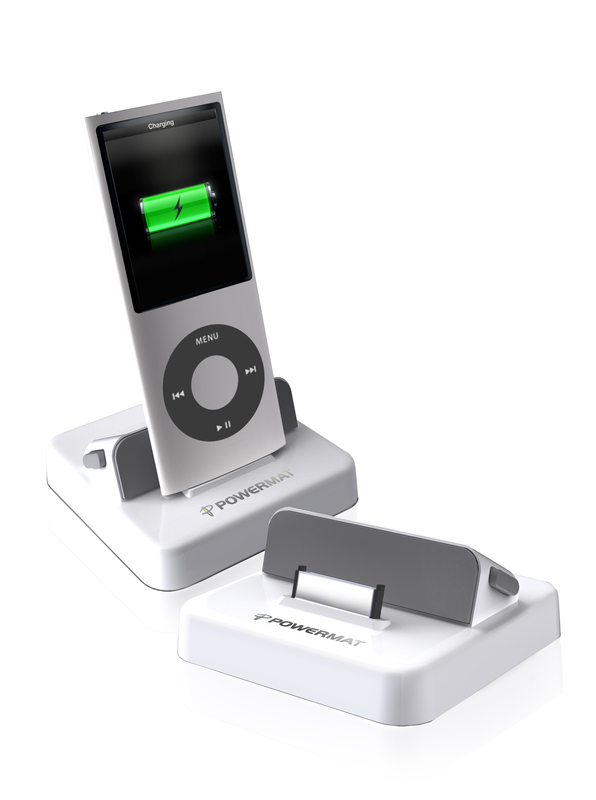 Use the sleek iPod dock to charge your iPod and set your Blackberry in for a charge. I was glad to find that Powermat does provide support for the iPad through the receiver dock for iPod and iPhone. In order for the Powermat to charge your device, your device must have a specific backend, case, or use the magical universal receiver. Some phone manufactures, such as Apple and RIM (Research in Motion), Powermat makes unique cases that can be used in lieu of the universal receiver. The Powermat case on the iPhone makes the phone bulky. But, if you own a Blackberry, you can replace the existing the back cover with a Powermat cover for charging-Slick! However, the ‘slick’ privilege may set you back $30-40. Unfortunately, Powermat only includes one universal receiver in the box. However, later this year, Powermat will be releasing a product that will enable more phones to be more conveniently charged through the Powermat. This product enables the ability to replace the battery door with one that will charge directly to the Powermat. At the end of the day, the Powermat is awesome. Personally, using the Powermat is more convenient than plugging a cord to my devices any day. Powermat is increasingly innovating their line. Over the next few months, Powermat’s products will help better your charging lifestyle. If you are willing to make the investment, charging will be easier than ever. The case on the iPhone has drawbacks, but if you are a protective of your iPhone, you may not mind. Bottom line, I love the convenience of the Powermat, but a little expensive for a charger. Financial Times is reporting that Google will be phasing out of the internal use of Microsoft Windows. According to Google employees that the operating security concerns have lead to the demise of Windows in Google. The policy was created after Google’s Chinese operations were hacked at the begging of January. Now new hires are given the option of Apple’s Macintosh or to lead the way open source with Linux and its multitude of flavors. Some at Google may be saddened by the news, but others were already headed towards the Mac for security concerns. Other rumors are circulating that Google will run its Chrome OS, but it may not happen soon. Unlike other large companies, Google has let their employees choose the OS of their choice. Should companies ban Windows because of the security risks they cause? Has Windows proven to be more of a hassle than help? Will other companies begin to eliminate Windows, or are does Windows control critical services unavailable on the Mac? CUPERTINO, California – May 31,2010-Apple reported today that their new hot product, the iPad, has reached over two million sales from the April 3rd launch date. Apple reached the two million figure in 28 days after Apple’s iPad reached its one millionth figure. Most sales can be accounted for in the U.S. Market, as the iPad was released to certain international countries four days ago. Apple did not report how many iPads sold internationally accounted for the two million figure. Earlier, Apple reported difficulty in producing enough iPads to meet the demand, but Apple appears to be meeting demands. It appears that people actually want a gigantic iPod Touch!